Are you caring, compassionate and want to make a difference in the community? We are a busy and growing care providor and we are recruiting for dedicated carers like you to come and join our friendly team. If you would like to come and work with us at Absolute Healthcare please call us on 01420 769658 or email your CV to enquiries@absolute-healthcare.co.uk. Do you have time to make a difference to someone elses life? Are you compassionate, caring and like the idea of giving something back? Then come and visit us on Saturday 5th November between 10am and 2pm for our recruitment day. Whether you have a few hours a week spare or more, we’ll be happy to chat through the variety of roles on offer and tell you all about the rewarding nature of what we do. for our recruitment day to and out more. Working as a carer can be exceptionally fun, satisfying and rewarding but can also be quite a challenging and demanding job. 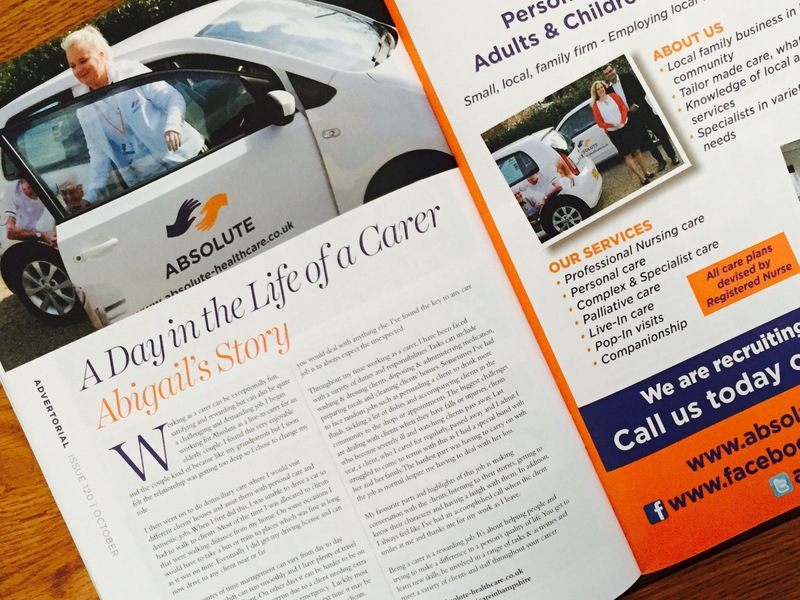 I began working for Absolute as a live-in-carer for an elderly couple. I found this very enjoyable and the couple kind of became like my grandparents but I soon felt the relationship was getting too deep so I chose to change my role. I then went on to do domiciliary care where I would visit different jobs. When I first did this, I was unable to drive a car so I had to walk to clients. Most of the time I was allocated to clients that were walking distance from my home. On some occasions I would have to take a bus or train to places which was fine as long as it was on time. Eventually I did get my driving license and can now drive to any client near or far. The pressures of time management can vary from day to day. Some days my shift can run smoothly and I have plenty of travel time between each client. On other days it can be harder to be on time as sometimes calls can overrun due to a client needing extra support, they are unwell of there is an emergency. Luckily most clients are understanding as they realise that next time it may be them that cause me to be a few minutes late to other clients. When I first encountered an unforeseen situation, I would panic on the spot and spend time gathering my thoughts before decoding how to act with the task in hand. After gaining more experience I learnt how to use my natural instinct and deal with a situation like you would deal with anything else. I've found the key to any care job is to always expect the unexpected. Throughout my time working as a carer, I have been faces with a variety of duties and responsibilities. Tasks can include washing & dressing clients, disposing and administering medication, preparing meals and cleaning clients homes. Sometimes I've had to face random jobs such as persuading a client to drink more fluids, tackling a lot of dishes and accompanying clients in the community to the shops or appointments. The biggest challenges are dealing with clients when they have falls or injuries, clients who become severely ill and watching clients pass away. Last year, a client, who I cared for regularly, passed away and I admit I struggled to come to terms with this as I had a special bond with her and her family. The hardest part was having to carry on with the job as normal despite me having to deal with her loss. My favourite parts and highlights of this job is making conversation with the clients; listening to their stories, getting to know their characters and having a laugh with them. In addition, I always feel like I've had an accomplished call when the client smiles at me and thanks me for my work as I leave. Being a carer is a rewarding job. It's about helping people and trying to make a difference in a persons quality of life. You get to learn new skills, be involved in a range of tasks & activities and meet a variety of clients and staff throughout your career. What effect will the EU Referendum have on the Health & Social Care sector ? Having spent 5 years developing a high-quality home health care service in North East Hampshire, Absolute Healthcare will soon be expanding its operations to cover West Berkshire. 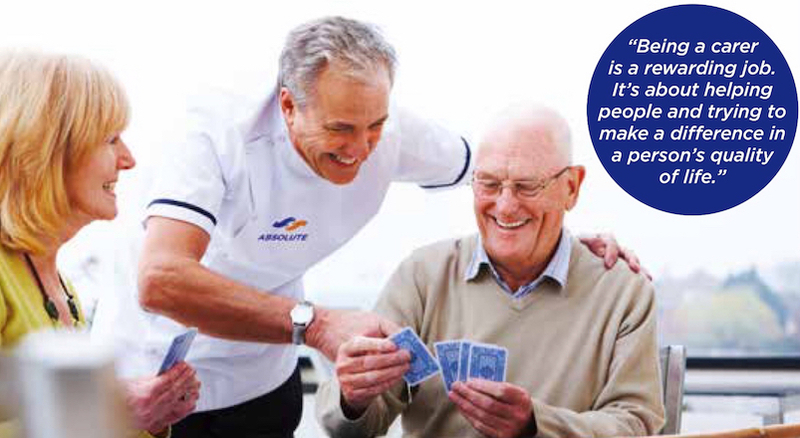 Absolute Healthcare are investing in Dementia Awareness and Dementia Care training for care staff, and starting a monthly 'Dementia Friends' session! “My daughter gave you the sad news about my dear wife. I just wanted to thank you and all your wonderful carers who came to help her. We became quite fond of all of them.” John, Alton.